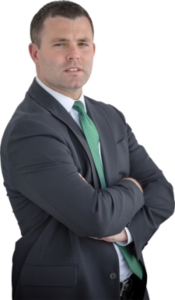 Joseph J. Higgins, III, is a Massachusetts Drunk Driving Lawyer who focuses his practice on defending individuals charged with Operating Under the Influence of Alcohol/Drugs (OUI, DWI, DUI) and other related motor vehicle offenses throughout all of Massachusetts. Mr. Higgins is a graduate of Connecticut College and Suffolk University Law School. While pursuing his Juris Doctor degree, Mr. Higgins served as an intern for the Honorable Regina L. Quinlan in the Barnstable Superior Court. He also worked as a law clerk for one of the premiere Personal Injury practices in the nation. After passing the Massachusetts Bar Exam, Mr. Higgins served as an Assistant District Attorney for the Plymouth County District Attorney’s Office. During his career as a prosecutor, Mr. Higgins quickly became known as a skilled, professional, and aggressive trial attorney. Assigned to the Plymouth, Wareham, and Brockton District Courts, Mr. Higgins prosecuted hundreds of Drunk Driving cases (OUI DUI DWI). This invaluable experience has provided Mr. Higgins with the knowledge necessary to best defend charges of drunk driving (OUI DUI DWI). Mr. Higgins is committed to providing personalized, tireless and skilled representation for all of his clients. He understands the drastic implications a drunk driving charge can have on a person’s life and firmly believes in providing his clients with the quality representation they need and deserve. Mr. Higgins has also been recognized by the National College for DUI Defense for his efforts as a criminal defense attorney dedicated to the defense of citizens accused of driving under the influence.